Ever since our favorite nail salon closed for business last month, my mother and I were on the look out for another nail salon. Last week, we decided to try Organic Rituals. 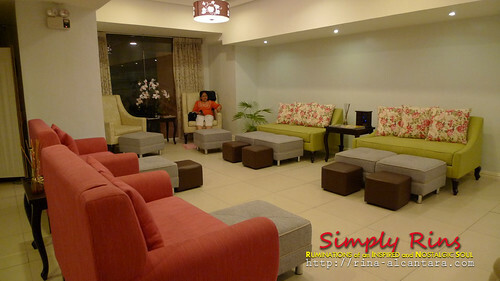 I encountered this nail salon while searching for a local distributor of Zoya nail polishes. I had a few nail salons on my list to check out but I decided to check Organic Rituals first. I kept myself busy taking pictures. 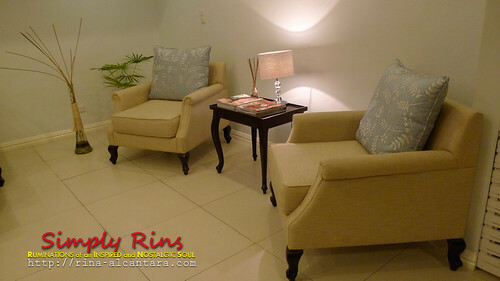 Organic Rituals have a spacious working area and comfortable sofas. These are details that I always look forward to in a nail salon. What's the point of getting pampered if you can't relax in your seat? I've experienced nail salons where nail technicians often bump each other because there's not enough space to move around. Comfy seats that you can make your own during your visit. As soon as you enter the salon, you will be asked for the type of service you wish to avail. During my first visit, I got the Long Wear Manicure and Long Wear Pedicure. It entailed cleaning, a little massage, and application of polish. My mother got the Rescued Feet with Pedicure. This service included a very relaxing foot spa. Zoya nail polishes! 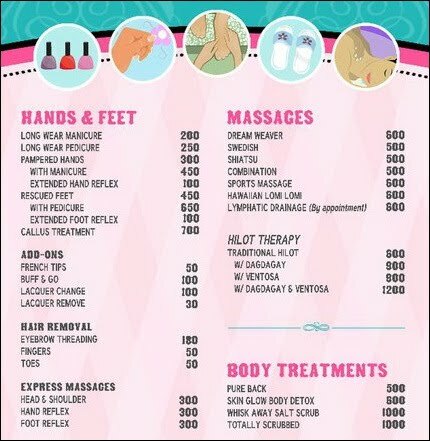 Choose one before your nail treatment begins. 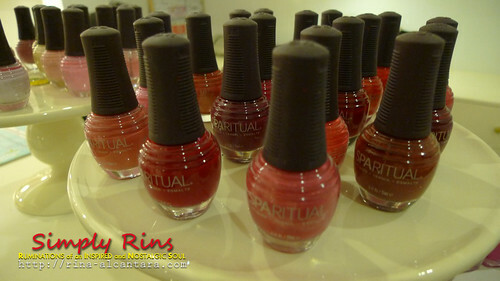 Sparitual nail polishes. I haven't tried this one. Probably on my next visit. Aside from the safe and non-toxin nail polishes, Organic Rituals also use organic scrubs, lotions, and oils for spas. 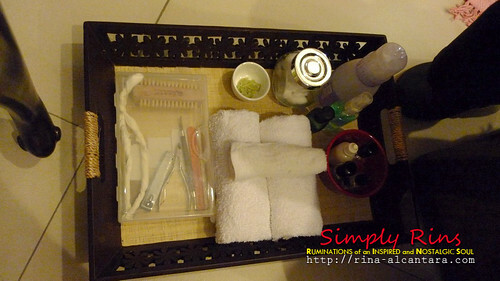 You will be asked to choose what you'd like to be used during your visit if you'll avail of a spa service. Nail and spa tools. So neat and classy! According to Organic Rituals, they single-use several tools such as nail file, buffer, and nail stick. 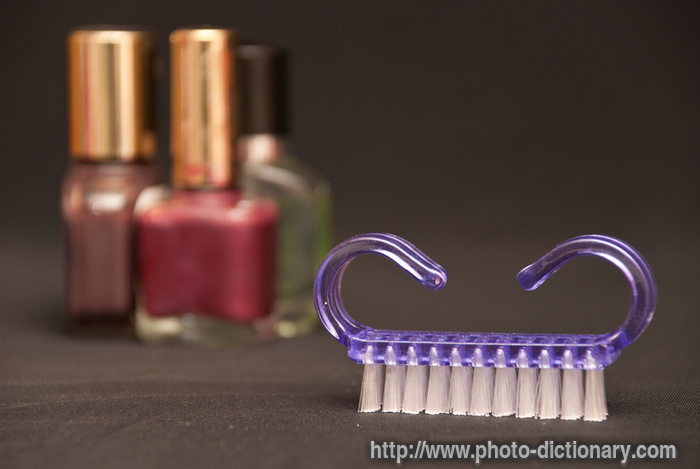 This highly promotes hygiene that's one of the main concerns of clients when they visit a nail salon. Twisted tissue paper as toe separators. Instead of using a toe separator, Organic Rituals rolls an approximately 5-inch long tissue paper and twists it before placing it in between my toes to act as a separator before applying the nail polish. I like this better than the usual toe separators because after awhile of wearing the latter, my toes feel stiff and a little numb. colors but sadly, haven't found one to purchase. Cuticle oil was applied after the manicure and the pedicure. It got a little messy after awhile. I might opt not to have this applied next time. Zoya Veruschuka also for my toes! During our visit at Organic Rituals, I appreciated that the nail technicians didn't use a nail brush when cleaning my nails. Instead, they used a small, clean and slightly moist white towel. My hands are quite sensitive in the sense that they easily get hurt. And so it is big thumbs up for Organic Rituals for not using a nail brush that sometimes hurt clients. I'm also very particular about cleaning excess polish after a manicure and pedicure. Sadly, I wasn't so satisfied with this. I'm usually into this detail when I'm wearing dark polish. I want a neat application. After the manicure, I found a few nails where the sides were not properly polished. I should have called the attention of my nail attendant regarding this concern. This will not however, hinder me from going back to Organic Rituals. Zoya nail polishes are for sale at Organic Rituals! For updates on promos and other details, visit the Organic Rituals Facebook Page and Organic Rituals Multiply Page. I can't wait to go there... I have zoya polishes pre-ordered! thanks for this! sure... i hope i could get my orders na this mid september, I can't wait anymore ahahaha! Hi again, Elsa! There's a store in 168 Mall that sells nail art accessories - http://rolandowong.sulit.com.ph/ - I believe the owner accepts orders online and is willing to ship it to you for a fee. Happy shopping!